Extraordinary Journeys Africa is also known as EJ Africa. The company organizes "bespoke" (custom-tailored) Africa safaris and trips for couples, families, and individual travelers. Extraordinary Journeys Africa luxury African safaris mix and match various vacation elements to come up with unique custom itineraries. Extraordinary Journeys Africa has planned over 500 private trips to Africa, each one unique. Company staffers get to know you through phone calls and email, and put long hours into planning the details of your unique private luxury safari and making connections for you in Africa. This New York City-based tour company was founded in 2003 by Marcia Gordon and her daughter Elizabeth. Marcia has worked in the African travel industry for over 30 years as director and president of leading luxury tour companies. Daughter Elizabeth was born in Africa, where Marcia owns a home. After graduating from Stanford University, Elizabeth worked in Namibia, she managing high-end luxury safari camps. Both Gordons know Africa as residents, with insiders' knowledge and personal connections to African properties, guides, and attractions. Extraordinary Journeys Africa Tours cater to various configurations of luxury travelers: couples (including many honeymoon duos), families, groups of friends intrepid solo travelers. What Extraordinary Africa travelers share is a desire to see the real Africa and to avoid touristy safaris. Extraordinary Journeys Africa travelers also share a willingness to splurge on once-in-a-lifetime experiences when the circumstances call for it. 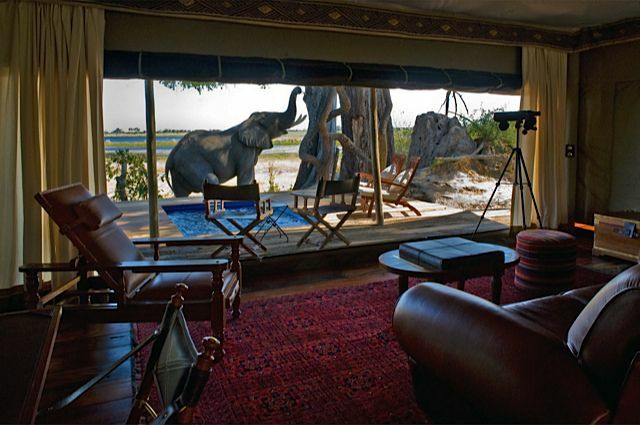 Twenty percent of Extraordinary Journeys Africa clients are repeat guests, a high percentage for the safari industry. One of three new clients is a personal referral from a previous Extraordinary Journeys Africa traveler. Will You Like an Extraordinary Journeys Africa Tour? Is Extraordinary Journeys Africa the Right Luxury Safari for You (or Not)? Says Extraordinary Journeys Africa co-founder Marcia Gordon, "We consider ourselves Africans. We know Africa inside-out and bring this intimacy to Extraordinary Journeys Africa clients. We also are very good at matching the right experience to the right person instead of imposing our tastes on your African vacation or safari." In addition, Extraordinary Journeys Africa makes a point of having extensive personal knowledge of every lodge, venue, and guide on client itineraries. Says Marcia, "Our goal is to create the best experience for each person, not the just the best known or most expensive places." Specialist guides are employed for small groups. Says Elizabeth Gordon, "Our guides' knowledge of their areas is unbelievable, and they know how to have fun." Clients who are couples typically do not have a private guide throughout, but are personally met at every camp or lodge. Extraordinary Journeys Africa accommodations include safari lodges, wilderness camps, private luxury villas, boutique hotels, and resort properties throughout safari country. Most properties are small and one-on-one, with an intimate atmosphere that may be very private or very social, as the clients wish. The company gives preference to hotel partners that enforce green sustainability and support community involvement. Extraordinary Journeys Africa is committed to the African communities that house their guides, hotels, and all-important wildlife. Among the company's African projects are cultural exchanges, environmental sustainability initiatives, support of schools and hospitals, and reintroduction of native plant and animal species.